It may have been unseasonably wet and windy on Saturday evening,but the inclement weather didn’t deter the local fans turning out in force for three division World Champion Lee McAllister’s latest promotional offering at Ayr Town Hall on Saturday night. 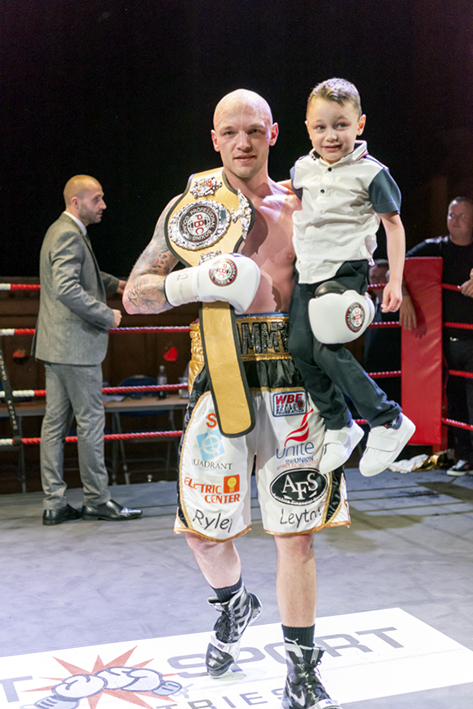 Prior to the first fight of the night, MC Douglas McAdam gave a passionate, yet solemn, eulogy for Scottish Boxing Legend Toby Dixon, father of former World Champion Scott Dixon, who had sadly passed away the previous Sunday aged 87 years, followed by a ten-bell salute. 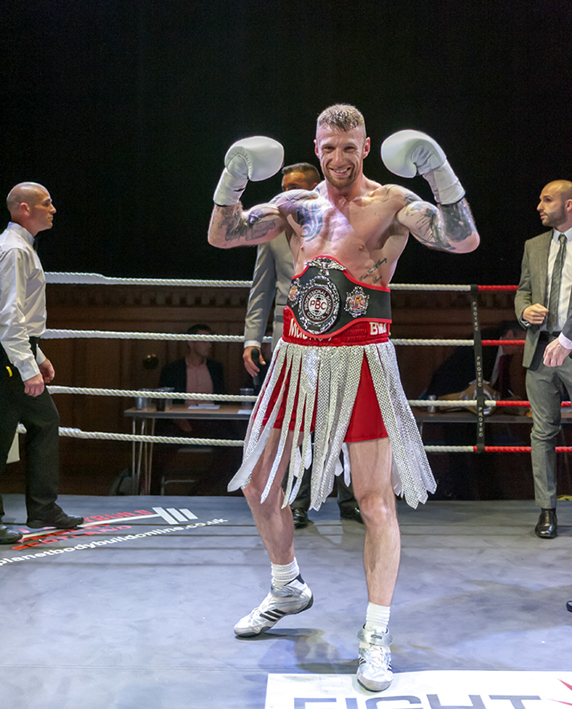 Following the ten-bell salute was the opening contest, between Prestwick’s Leon Roberts and Liverpool’s Paul Peers was an absolute barnstormer of epic proportions. Right from the opening bell, both young warriors charged into centre ring and locked horns in a true Gladiatorial Battle Royale that thrilled the ensemble audience for the entirety of the contest. After four all action rounds, the fans showed their appreciation, for such a truly excellent, closely fought contest, to both fighters with a standing ovation, and that’s before Referee Edward Law’s scorecards were even read out, no surprise then that when it was and showed local lad Robert’s receiving the victor’s laurels the decibel levels went through the roof. 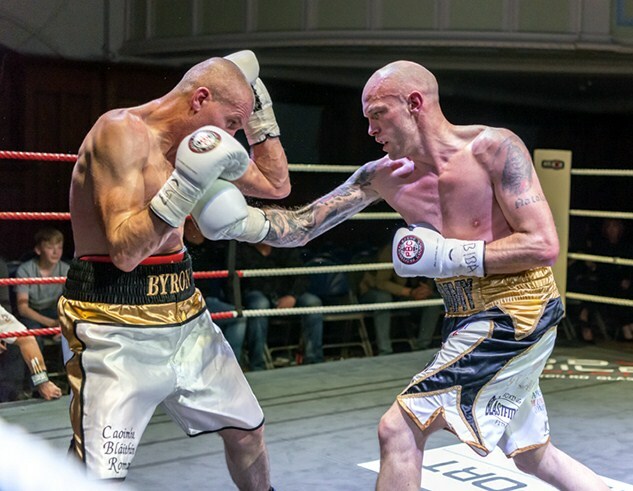 Next up was another cracking fight between Aberdeen’s Nathan Beattie and Belfast’s Marty Kayes. Whilst not quite an all out war like the preceding bout, it was a fantastic technical contest that thrilled the fans in a different way. The two lads clearly know each other very well, no surprise since they had sparred previously, as well as fought each other on Beattie’s debut. This personal knowledge of the others style, could easily have had a negative effect, making for a boring fight, but not in this case. Both protagonists showcased their superb pugilistic skills and exceptional ring craft throughout the contest, as with the previous fight, many of the rounds were very close, so it wasn’t a foregone conclusion just who would have their hand raised at the end of six hard fought rounds, however the Scottish fans were not to be disappointed as it was Beattie that got the nod from scoring Referee Edward Law. Have to say the next bout, between Irvine’s Sandy Robb and Belfast’s Ryan Kilpatrick looked like it was going to be another thrilling all out war for the first minute or so, as the dynamic duo planted themselves in centre ring trading power punch after power punch. However, Robb’s superior experience came into play, the canny Scot dipped under the Irishman’s leading arm, before letting rip with a massive pinpoint perfect body shot to send Kilpatrick down to the canvas and take the win by first round TKO right on the one minute and thirty second mark. Next up see the return of Irvine’s very own George McIlroy against Stockport’s Will Cairns, for the Professional Boxing Council (PBC) International Silver Middleweight Championship. The partisan crowd gave Cairns a very warm welcome, as they had for every single fighter throughout the evening, however once again the decibel levels went through the roof when their man McIlroy began his ring-walk. Round one was a hard fought affair, both protagonists were clearly fired up and determined to become the first ever Professional Boxing Council (PBC) Champion, so much so that control of the round changed hands so often in the early stages, however that was soon to change, when McIlroy landed a powerful body shot to send Cairns to the canvas in the second half of the round. Much to the delight of the crowd, McIlroy’s confidence grew in the early stages of round two, the canny Scot controlling the proceedings seemingly with ease, don’t get me wrong Cairns had his fair share of success in the second, just that he was being a wee bit more cautious than he had in the first. More of the same in the third, with McIlroy seemingly controlling the majority of the action, however saying that, the shot of the round was definitely Cairns, who cleverly engineered a sensational move that see him open up the excellent guard of the Scotsman for the merest fraction of a second, but more than enough for Cairns to land a massive right to the granite chin of McIlroy. McIlroy stepped up the pace early in the fourth, corralling Cairns in to a corner on a number of occasions, the Englishman managed to fight his way out in true style a couple of times before the Scot got through his guard and sent him to the canvas for a second time. Following the restart McIlroy was all over Cairns like a rash, the Englishman maybe rashly decided that attack would be the best form of defence, whilst landing a few good shots this action left him open and McIlroy didn’t need a second invitation, he just walked Cairns back towards his own corner before letting rip with a massive onslaught ending with another big right to the body to send Cairns down once more. Cairns made it to his feet but was clearly unsteady, sensibly referee Edward Law decided not to take any risk and waved the fight off on the one minute and twenty-five second mark of the fourth round. Headline bout of the night was a second PBC Championship contest, this time between World Boxing Foundation (WBF) United Kingdom Champion Symington’s Sammy Hill and Dundalk, Ireland’s Michael Kelly for the PBC Celtic Welterweight Silver Crown. Without doubt this proved to be the perfect fight to close out a fantastic night of pugilistic action, it was one helluva closely fought battle that could have gone either way. In fact by three quarters of the way through I was convinced the result was going to be a draw. The all action bout see control switch not just round by round, but seemingly minute by minute. In the penultimate round Hill stepped up the pace, just as it seemed Kelly was beginning to fade a little. This proved to be a pivotal point in the contest, as Hill went on to secure the win and his second Championship belt in as many contests by a mere two points. 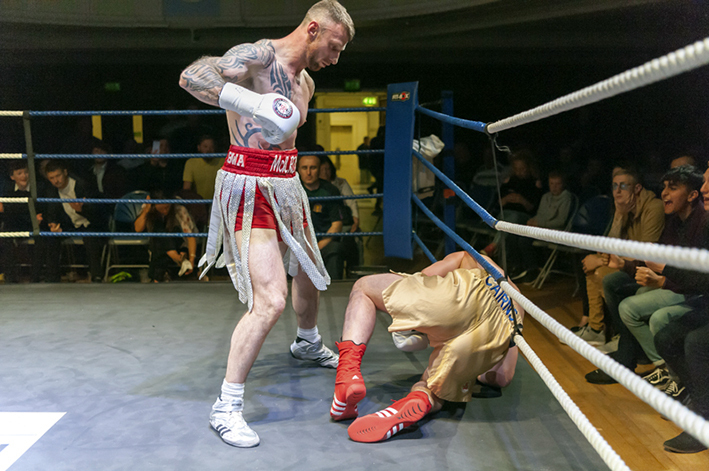 Following the event promoter Lee McAllister, not only praised the boxers but also announced that he would be back in Championship action later this year, on a self-promoted event at the Beach Ballroom in Aberdeen on the 20th October.